Dominican cuisine can be quite complicated, but Karl-Anthony Towns likes to keep it simple. Sancocho, the Dominican Republic’s national dish, includes beef, chicken and sometimes even pork, all meats that are regular staples in most Dominican meals. But whether it’s his food preference or his love for his mother’s Dominican heritage, the Minnesota Timberwolves big man is committed to what he truly enjoys. “I love arroz con pollo,” Towns told The Undefeated. “I keep it really simple and plain, to the point. My mom makes some of the best chicken and rice and I know why. She makes it how my grandmother makes it and the recipe was passed down. There is nothing better than having some of mom’s homemade cooking. Towns got some early lessons on his Dominican heritage during weekend barbecues at his grandmother’s home in Perth Amboy, New Jersey. There was always lots of Dominican food. Towns and his first cousin, Michael Quezada, loved eating pollo empanizado (breaded chicken) with white rice beans and plantains. They always played basketball in the backyard, too, while listening to lively music in the background. “What I really enjoyed was just being in the backyard barbecuing,” Towns said. “We had a lot of talking. Listening to music, that’s where my love for it started. Me and my family did a lot at my grandmother’s house. We always had, every Saturday or Sunday, barbecues at her house in the summer. Karl-Anthony Towns with family from his mother’s side. There was always bachata, merengue and salsa music playing as well. Despite Towns’ unique height and big feet, his sister actually taught him how to dance. Towns said he has Latin music saved on his cellphone to play on special family occasions. “My family loves to dance. They tried to grab anyone who was near to dance. The house was full of music. It’s just a lot of fun. A lot of great memories,” Towns said. Towns said his mom took him on his first trip to the Dominican Republic when he was 15 years old. They visited Santo Domingo, the capital and largest city in the Dominican Republic. It was during this visit that Towns truly fell in love with his mother’s homeland as they took in the history, monuments and sites. “My whole life leading up to that point I’d only seen the USA. To see the way my mom’s country is, how beautiful it is, see a different side of the world, it was eye-opening. It was amazing. I had so much fun. I enjoyed it,” he said. Towns rose to a height of 6-feet-11 by the time he was 16 years old and earned elite basketball skills to boot. ESPN.com ranked him as a top 10 prospect in the Class of 2014. It was safe to say that USA Basketball would have had strong interest in the American big man to compete in the 2012 London Games. 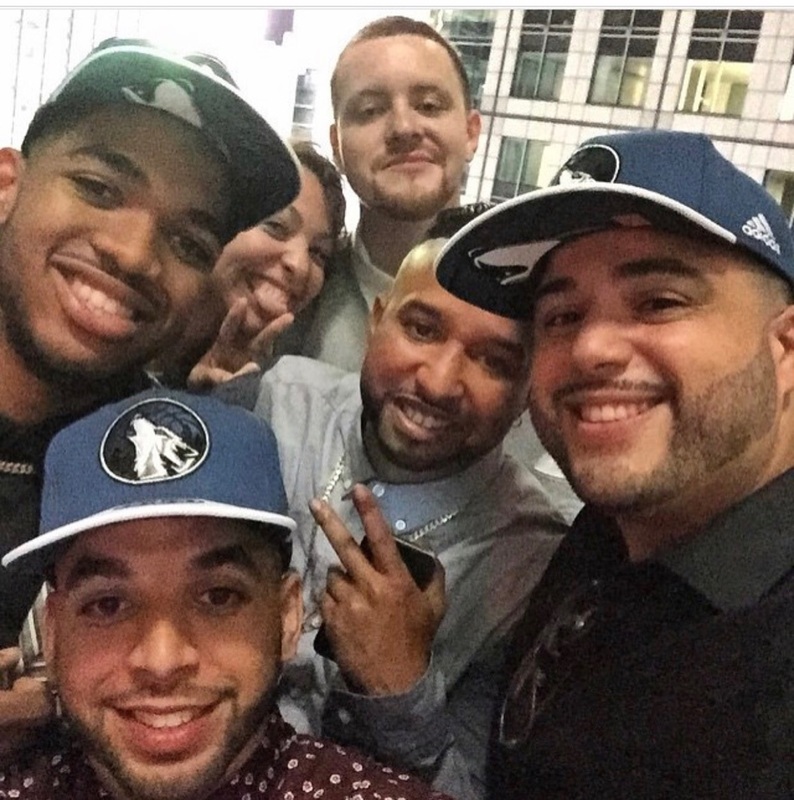 Towns, however, opted to play for his mother’s native Dominican Republic instead. In July 2012, he was introduced to the basketball world when he played against a USA team led by Kobe Bryant and LeBron James in an exhibition game. There was no rematch though, as the Dominican Republic didn’t qualify. The country known for baseball dominance has never made an Olympic appearance in men’s basketball, while USA has won 15 gold medals in 18 appearances. 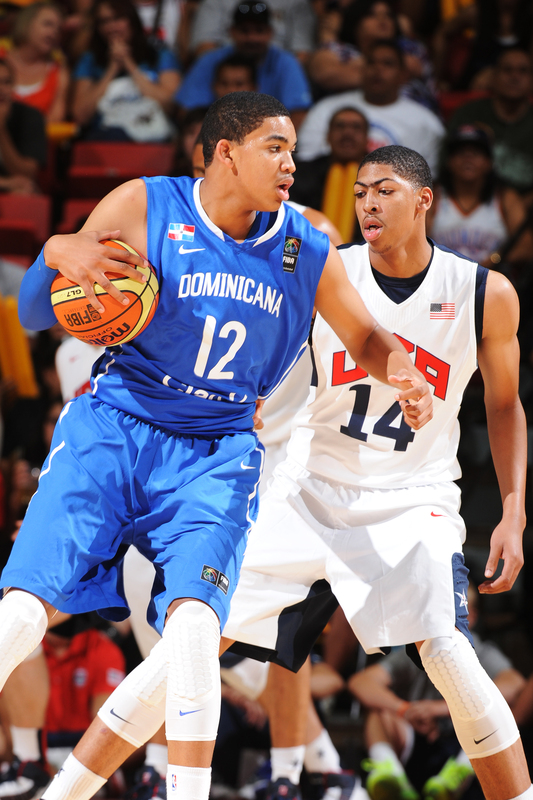 Towns decision to play for the Dominican Republic made him ineligible to join Team USA. Had he been eligible, he could have qualified for the USA’s team in the 2016 Rio de Janeiro Games. Even so, he doesn’t regret his decision to play for his mother’s home country. Karl Towns #12 of the Dominican Republic Senior Men’s National Team posts up during an exhibition game at the Thomas and Mack Center on July 12, 2012 in Las Vegas, Nevada. Considering the pride that Towns’ family and followers in the Dominican Republic and in the New York area have toward him, his loyalty is understandable. “My grandmother comes back with tons of newspaper articles from the Dominican Republic every time she visits,” Quezada said. “Everyone knows who her grandson is. I’m from Washington Heights, New York City, and he’s huge over there. He’s the most talked-about player in all the Dominican barbershops. Towns starred at the University of Kentucky for a season before being drafted with the No. 1 pick in the 2015 NBA draft. He averaged 18.3 points, 10.5 rebounds and 1.7 blocks per game last season, and has improved, averaging a double-double of 21.5 points and 11.5 rebounds through 34 games this season while scoring a career-high 47 points against the New York Knicks on Nov. 30. While the Timberwolves’ poor record will likely be held against him, an individually worthy Towns will learn whether he will be selected for his first NBA All-Star appearance later this month. And once he gets some free time, Towns said, he hopes to learn Spanish fluently in 2017. He has asked his mom and sister to speak to him exclusively in Spanish to help further his growth. He hopes to eventually be comfortable conducting media interviews in Spanish and would like to return to the Dominican Republic next off-season. “I understand Spanish, but I can’t speak it very well,” Towns said. “I understand what you’re saying so I mostly speak like a Spanglish. My grandmother, my mom and my sister speak to me in Spanish and I speak back in English.